To learn more about the professionalism CLE guidelines, click here. To easily reference A Lawyer’s Creed and the Aspirational Statement on Professionalism in your presentations and papers, use a line-numbered version of the documents, which you may find here. *NEW* Are you creating a Judge’s Panel for your professionalism program? If yes, review the EXCELLENT talking points paper prepared by Betsy Hodges as an example of HOW you can prepare your judges for a fun and germane professionalism discussion. You might use different hypotheticals or different professionalism talking points to these same hypotheticals, but Betsy’s excellent paper will give you an idea of how to get started! To see Betsy’s professionalism application work product submission, click here. *NEW* While it is not necessary to write a treatise to get professionalism approval, the Commission LOVES thoughtful and scholarly written material. To see an example of an excellent submission for professionalism written material prepared by Ron Daniels, click here. Payal Kapoor recently shared a great professionalism training tip. 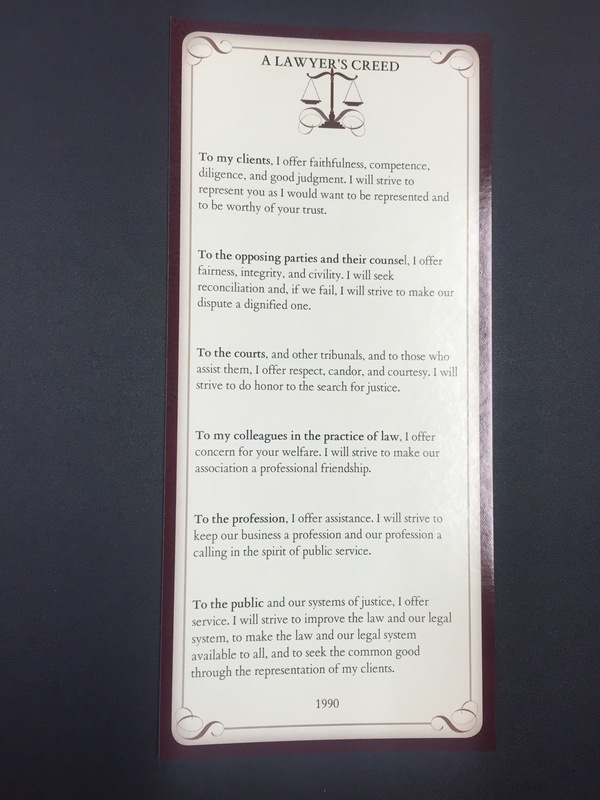 Read each of the tenets of A Lawyer’s Creed and then ask participants to share an example of how he or she has applied that tenet of the Creed in his or her professional life or law practice. Having a panel discussion is a great way to get lawyers and judges to think about the meaning of professionalism. See the materials and discussion questions created by Phil Sandick for the Georgia Legal Services Program Pro Bono Roadshow at the link here. You can find several hypotheticals in the Professionalism CLE Planning Guide – OR YOU CAN CREATE YOUR OWN. See the hypotheticals created by Camille Hope and Walter Kelley for the Middle District Bankruptcy Law Institute, here. To view an EXCERPT from a power point presentation created by Trish McCann for a CLE for the Georgia Public Defenders Council, click here. Your professionalism written materials do not need to be long scholarly treatises or law review articles on professionalism. A short paper that asks lawyers to consider a few professionalism pointers is sufficient. As an example, see Karlise Y. Grier’s written materials for the upcoming Solo and Small Firm Institute at the link here. *NEW* To view a power point presentation created by Karlise Y. Grier and Leslie A. Stewart for Eliminating Barriers to Justice V, click here. To view a professionalism paper from the Commission’s June 8, 2018, presentation on Social Media and Technology for Judges and Lawyers, click here. *NEW* To view a professionalism paper entitled How to Avoid a Cultural Minefield in Your Law Practice When Working With International Clients or Colleagues from the Commission’s November 30, 2018, Convocation on Professionalism and the Global Community, click here.